“It is thrilling to partner with OHUB as we work to ensure everyone has access to skills and career paths from which they may flourish and that our clients need,” – ActOne Group Founder and CEO, Janice Bryant Howroyd. 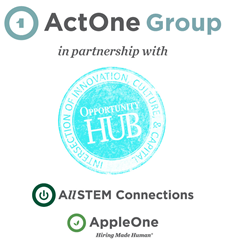 Today, Opportunity Hub (OHUB) and ActOne Group announced a new partnerships to diversify the STEM workforce. OHUB is advancing its mission to ensure everyone has access to STEM jobs by joining forces with the ActOne Group, a global employment and workforce management company founded by Janice Bryant Howroyd. Howroyd is the first African American woman to build and run a $1 billion business, which includes AllSTEM, a staffing company focused on placing talent with the STEM related skills OHUB helps members develop. According to the US Department of Commerce, demand for STEM related jobs grew six times faster than non-STEM related jobs over the past decade, and demand is expected to grow an additional 8.9 percent by 2024. These jobs are highly compensated paying an average of 29 percent more than non-STEM jobs, but despite high demand and a true opportunity to create pathways from poverty to the middle class and beyond, there is a persistent lack of ethnic diversity in STEM fields. Data from the Pew Research Center found that black workers make up 11 percent of the U.S. workforce, but only nine percent of STEM workers. The underrepresentation is even starker in Silicon Valley where blacks make up just three percent of the total workforce. OHUB is working to change this. As featured in a recent Harvard Business Review article, thousands of college students and career changers from all backgrounds, particularly students of color that are actively enrolled at over 250 colleges and universities have joined OHUB since June 19th to level up their tech and non-technical skills, access in demand careers in tech, identify startup entrepreneurship resources, access early stage capital and receive information on exclusive investment opportunities traditionally reserved for the affluent. OHUB will help its members secure great jobs by connecting work-ready talent with a personal AllSTEM or AppleOne recruiter. The recruiter will provide personalized career-ready assessments as well as job placement and other related resources to OHUB members. Janice Bryant Howroyd and Rodney Sampson will talk more about the partnership at this Friday’s #TechToWealth Tour in Los Angeles featuring the legendary Young Guru and Jamilah Lemieux. Visit https://opportunityhub.co/actone/ for more information about the partnership. ActOne Group is a global enterprise that provides employment, workforce management, and procurement solutions to a wide range of industries, Fortune 500 organizations, local and mid-market companies, and government agencies. Learn more at http://www.act1group.com. AllSTEM creates powerful connections for STEM Professionals and Employers. Taking a people first approach, AllSTEM focuses on guiding the progression of careers and transformation of businesses. Learn more at http://www.allstemconnections.com. Opportunity Hub (OHUB) is the world’s leading inclusive innovation (tech), entrepreneurship (startup) and investment (multi-generational wealth) ecosystem building platform. OHUB’s products, programs and private equity investment thesis ensure that socially and economically disadvantaged communities of color pursue and gain high demand tech skills and careers, launch and grow high growth startups, access private equity capital and invest in exclusive investment opportunities traditionally reserved for the affluent. This is the definitive path out of generational poverty, into to the middle class, multi-generational wealth creation and beyond. Aspiring innovators, entrepreneurs and investors apply for membership to OHUB to access skills development programs, career opportunities, high growth company building resources, funding and investment opportunities to build multi-generational wealth. Companies, foundations, municipalities, startup organizations, influencers and advocates desiring to increase their investment in authentic internal and external diversity, equity and inclusion fund and sponsor the programs, jobs and investments.